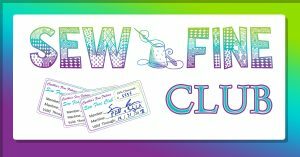 Share the fun and creativity of sewing, quilting, embroidering and serging at Cynthia’s Sew Fine Club. Cynthia and her staff will demonstrate exciting new feet, notions, techniques, designs and projects at each session to make your sewing more fun. Open to everyone with ANY brand of machine. Exclusively for Sew Fine Club members. Guest $15. Not a member? Call 954-724-2900 today!